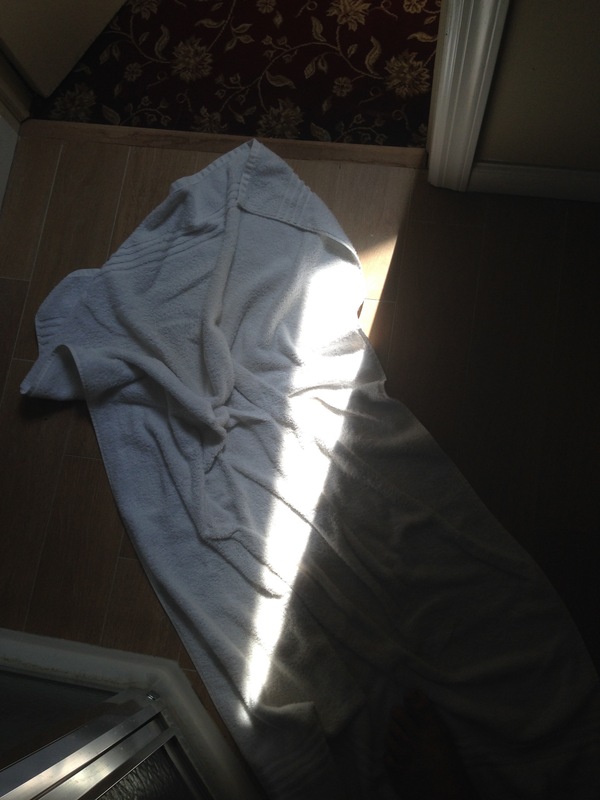 In just over eight minutes, this specific sunbeam travelled ninety-three million miles and found its way into my bathroom via the skylight my dad singlehandedly installed more than twenty years ago. The least I can do, and simultaneously the most I can do, is free my true self from the maze of incessant thinking for just long enough to be grateful for this sunbeam’s effort and effortless beauty. But while I’m here, I’ll take a moment to also be grateful for the vast reaching butterfly effect: The Big Bang, our spiraling galaxy formed, the sun and earth next, my grandfather came through Ellis Island from Russia when he was eleven years old, my dad and mom watched Star Trek episodes together before they were married, I blamed my sister for eating my pancakes when we were little but the guilty party turned out to be my black lab Chuckles, my dad installed the skylight with a reciprocating saw he “borrowed forever” from work, light left the sun eight minutes and twenty seconds ago, and here you are reading this.